This tutorial demonstrates how to download a web page from the internet, and then modify that web page to use local graphics resources before displaying to the user. Perhaps you want your app to dynamically load data from the internet, but you frequently want to display the same images. Using local images can be a good way to cut down on the amount of bandwidth needed for an application and could improve performance. If you haven't all ready, please take a look at the previous tutorial, displaying a static web page in android.This tutorial will be building off of that. Rather than just load a http url into the webview, we will want to download the source ourselves, and then modify it so it contains references to our local images. I'm not going to go into detail about how the AndroidDownloadHelper class works in this tutorial. The source is pasted below. 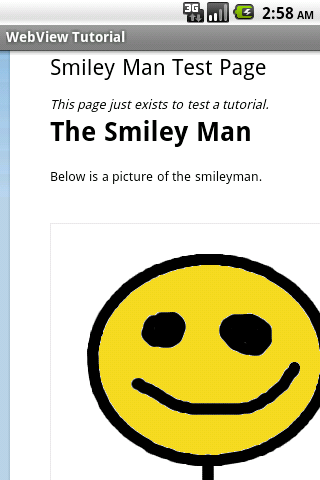 I created a special page on this blog for this tutorial http://www.androiddom.com/p/smiley-man-test-page.html If you click on this link you will see the words IMG1 at the bottom. 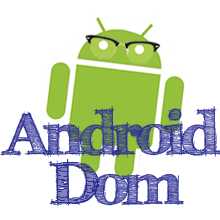 Our Android App is going to look for those words, and then replace it with the picture of the smiley man from the previous tutorial. The code below will download the WebPage to a single String. From there we can manipulate the data before we pass it off to the WebView. We create a StringBuilder to store the modified web page. Then we look for the IMG1 tag, replace it with code to reference our asset, and load the new webpage into the WebView. Because it has to be, even though it means nothing. This is what the JavaDoc for that function says. This tutorial demonstrates the basic idea behind using the WebView to fetch an external page but display with local graphics. It should also be noted that the images don't have to be assets in your project. You could also load an image from the SD card. The full source for the Activity is listed below. Good information. Which is more efficient and effective. Storing images the way you have here or storing it in sqlite? I guess I'm not sure which is more efficient. I do not know enough about the inner workings of SQLite. Personally, I would probably go with storing the image files on the file system. These separate files would be easy to create, open, and delete. And I would guess that I would probably run into less problems when working with them. Debugging SQLite errors can sometimes be more difficult. I'm trying to use getUrl() to replace the 'downloadtext' value so it always apples to the current URL - but I'm a big noob and having problems. Can anyone advise how i can do this? what if i want to display image according to screen sizes.. i.e if i want to display html image from drawables..